Satisfy your hunger for authentic Tex-Mex. Austin Grill offers a variety of lunch and breakfast items, come by and check out our delicious offerings! Follow us on Instagram, Facebook or Twitter for the latest news & promotions. Craving for a hearty classic or Canadian breakfast? We've got you covered all-day! And don't miss out on our daily specials that'd be sure to have you coming back for lunch too. Authentic Tex-Mex cuisine made on-site with fresh ingredients every day! Find burritos, tacos, nachos, salad and more! Opening in January 2019. Booster Juice offers freshly made smoothie on campus, which help students to thrive for a healthy and balanced diet. At Fuse Cafe, you can enjoy a hearty breakfast or customize your gourmet burger for lunch. Our Grill & Co. burgers are made with 100% Canadian beef or chicken so you're going to Taste It. Love It. Crave It. Gateway Cafe now offers We Proudly Serve premium Starbucks® hot beverages! Come and enjoy handcrafted drinks with delicious baked goods, snacks and lunch offerings. Market Kitchen offers a variety of global gourmet food. Choose from our fresh deli items, pizza, international foods, and more. Get made-to-order poké bowls and donburi topped with fresh ingredients and house-made sauces. Meatless poké bowls and bento are also available. 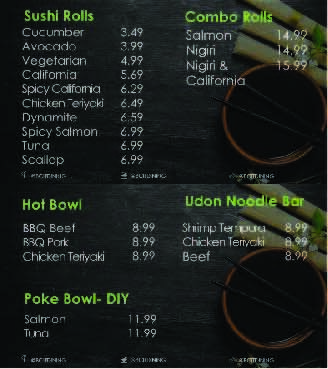 Plus, don't miss our Super Sushi Tuesday for the best lunch deal on campus! Smokes offers the best poutine on campus. Made with fresh hand cut fries, squeaky cheese curd, Smoke's signature gravy, and so many delicious ingredients to load on top! The best coffee spot on campus! The Rix Cafe offers We Proudly Serve premium Starbucks® beverages plus scrumptious breakfast, lunch, and baked goods. Offers a full menu including coffee, pastries, sandwiches, soups, chili and all-day breakfast. Always fresh! Offers your favourite Tim Hortons items on the go. Come by to grab coffee, donuts, and more. Always fresh! The best place for burgers and shakes! Triple O's offers a full menu of gourmet burgers, sides, drinks and more.